I have to admit, the financial support that we got over the last two weeks has been astounding and reached far beyond my expectations for the launch of our Patreon campaign. When we started working on the Patreon page with Juan, we expected that it would take a few months and the publication of Godot 3.0 to bring us near to our $3,000 monthly goal which could secure us Juan's full-time dedication to the project. And here we are, two weeks in and already 80% funded, with barely $600 missing to reach our main goal - and it keeps growing slowly but steadily, with a daily influx of new donors. We want to thank you all for your incredible support! Whether you contribute to the engine's development via code, bug reports, testing, teaching, developing awesome games or donating to the project, you all participate in making Godot! And this is also very invigorating. We are a non-profit project, dedicated to making the best free and open source game engine not for our own sake, but for anyone wanting to develop games. Seeing that we are able to crowdfund the development of our engine proves us the worth of our voluntary work as free software contributors, and that we are creating something really unique with Godot. Since I started following Godot's development in late 2014, and got involved as a contributor mid 2015, I could observe the growth of our community of users and contributors, and I'm happy to say that we are still growing at an overwhelming pace! August 2017 is not finished yet, and still it's already our all time high both for the number of newly opened issues (following the release of 3.0-alpha1 last month) and pull requests! The least I can say is that we are living in interesting times! To see so many contributors gravitating around our humble piece of free software makes me very confident that Godot 3.0+ will impose itself as a major game development tool for big studios and indies alike. Now, now, that's enough self-gratification for a day, let's go back to our other topic: the Patreon rewards. First off, for those who missed it until now: we are running a Patreon campaign with a main goal to hire our lead developer, Juan Linietsky, so that he can work full-time on the engine. Patreon is a platform for "creators" to be funded directly by their fans, often in the exchange of rewards related to the creator's expertise. As an incentive for our community members to donate to the project, we thought of various perks that could be proposed for successive tiers, and many of you already pledged at the various levels. The main reward for everyone, whether they donate or not, is Godot Engine's steadier development. Being able to hire Juan full-time means that the engine gets better faster for everyone. As a non-profit project supported by a US-based charity (Software Freedom Conservancy), there are restrictions on the kind of services or products that we can monetize. As such, in order for all pledges to fully qualify as donations and not as taxable business income, we need to make sure that the rewards we offer have no or little fair market value. Anything that we grant to patrons should benefit the project as a whole, and eventually be accessible to everyone. As such, after reviewing the language of all proposed rewards with our Conservancy lawyer Tony, we decided to reword some of them for clarity (and to comply with the law regarding to charities in the US) and make sure that they can't be interpreted as e.g. work-for-hire. We also took this opportunity to upgrade all rewards above $14 to their upper tier. In other words, we reduce the minimal pledge amount for each tier. Which means for example that if you had previously pledged $14 for the "Generous Thank You" level, you will now also be able to vote on the monthly tutorial and demo that we will produce for everyone (which was previously for $18+ patrons). Similarly, if you had pledged $18 to vote on tutorials and demos, you will now also be invited to participate in the monthly video Q&A with the developers. And so on and so forth; the $5 and $10 rewards stay the same. Vote for tutorials and demos: Each month, the whole community will be able to propose ideas of tutorials and demos. The developers will make a pre-selection of what is doable and interesting, and will submit it to the vote of the $14+ patrons. The selected tutorial and demo will be produced during the month and shared with the whole community. Live Q&A video: Each month, pledgers at this level or upper will be able to ask questions to the devs in written form. Those will be used to prepare a live video Q&A where these questions will be answered. During the live, the patrons will also be able to ask further questions via the video chat. After the live, the video Q&A will be made available to the whole community. Note that this reward used to give three vote points for tutorials and demos, but it was reduced to two to be better balanced. Vote on the roadmap: Each month, the whole community will be able to propose features to put on the month's roadmap. Live for tutorials and demos, the developers will make a pre-selection of what fits the interest of the project, and the patrons at the $26 tier or beyond will be able to vote for one of them, which should be implemented in the master branch during the month. So as you can see, nothing earth-shattering in our rewards - as mentioned above, the main perk that we offer to everyone is the free and open source Godot Engine, and the Patreon rewards were designed to be positive additions for the whole community (new tutorials and demos every month, video Q&A, more transparency regarding the roadmap and a way to get suggestions reviewed). If you feel that some of the changes we made are not appropriate, please get in touch with us to discuss it. Several users asked us if they could continue donating directly to our Conservancy account via PayPal, instead of using Patreon. This is of course possible, and you can do so from the donate page using the PayPal button. The donations that we get via this channel will be used as we did up to now, to cover project-related travel expanses, marketing material for events and specific hardware when necessary. In the near future, we will add a way for you to donate via PayPal for our "hiring Juan and further devs" campaign, i.e. we will sum the Patreon and PayPal pledges to see how much funds we have each month to hire developers. We will post about it as soon as this is in place. 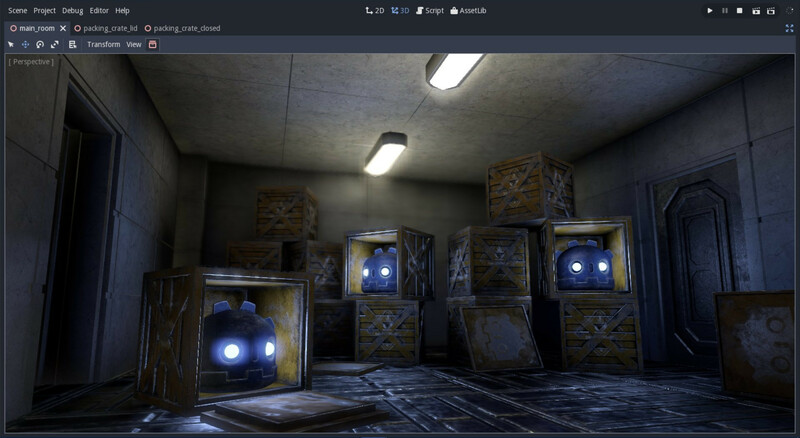 The awesome unrelated header of this blog post is a Godot 3.0 render of a scene by fracteed, one of our excellent PBR artists!